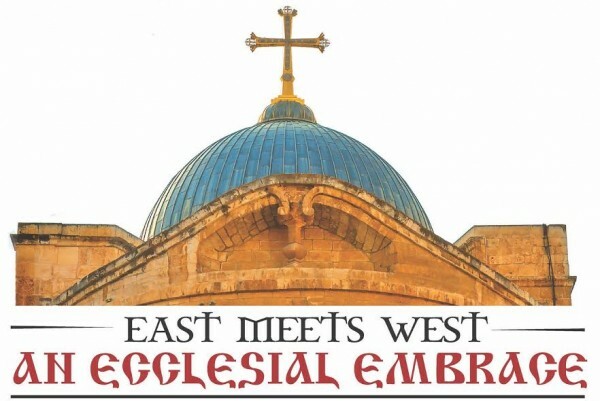 An exhibition—“East Meets West: An Ecclesial Embrace”—opened on the campus of Neumann University here on February 23, 2015. The exhibition, which commemorates the historic January 1964 meeting between Pope Paul VI and Ecumenical Patriarch Athenagoras in Jerusalem, runs through April 24 at the University Library, One Neumann Drive, Aston, PA. It is free and open to the public. In conjunction with the exhibition, Dr. Aristeides Papadakis, Professor Emeritus of Byzantine History at the University of Maryland, will deliver a lecture titled “The Schism of 1054: Points of Reflection” on Wednesday, March 25 at 7:00 p.m. The lecture, which also is free and open to the public, will be held in Sacred Heart Chapel in the Bachmann Main Building. Additional information and an event flyer, which includes a schedule of exhibition hours, may be found on the web site of Saint Tikhon’s Seminary.